A chocolate brownie is a flat, baked square or bar which was first introduced in the United States of America at the end of the nineteenth century & popularized in both the U.S. & Canada during the first half of the twentieth century. A brownie is like a cross between a cake & a cookie in texture. They are either fudgy or cakey… it all depends on their density & may include nuts, chocolate chips, etc. 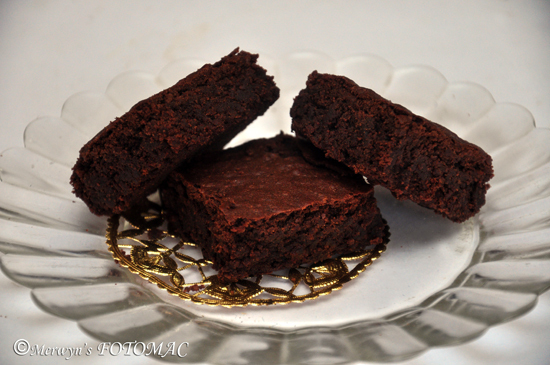 Brownies are great as a mid-morning snack & are often accompanied by milk or coffee. They are especially popular & served as a dessert at restaurants. They can be served warm with ice cream. 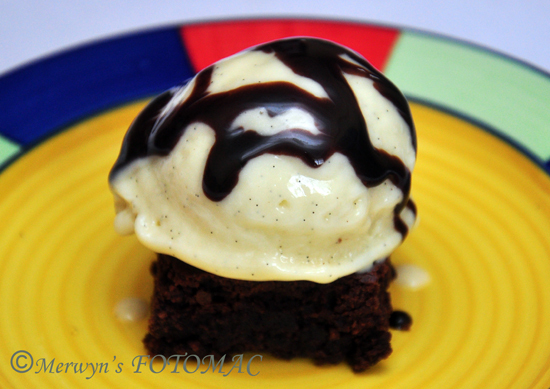 Today’s post is this delectable fudgy chocolate brownie which children as well as adults will enjoy. It is a great comfort food rich in chocolate which you can bake & relish with a large scoop of vanilla ice cream or any of your favorite ice cream. Brownies are ideal on a cold winter day or a rainy day … just bake & enjoy in the comfort of your home with a warm glass of milk or a hot cup of coffee. Pre-heat the oven at 175C. Sift together maida, cocoa powder & salt in a sufficiently large bowl. Break the chocolate into small pieces in a bowl & microwave or melt it with butter using the double boiler. Stir well till the chocolate is melted & smooth. Allow to cool for a few minutes. Whisk egg yolks, sugar,vanilla essence & milk in another bowl. Stir till well combined & sugar dissolves completely. Add this mixture to the melted chocolate mixture & stir well to combine. Add the flour & cocoa mixture a little at a time & gently fold in to form a thick batter. Do not over mix. Line with parchment paper an 8X8 sized square baking pan with about an inch of overhang. Pour the prepared brownie batter into the prepared baking pan. Level the batter & bake in a pre-heated oven for 20 minutes or do the toothpick test. Your fudgy chocolate brownies are ready to be served. Serve plain or with vanilla ice cream. Looks amazing Hilda! Great photography too!